Today marks a very special day because it’s the launch day of a brand new exciting concept & brand – Etta French. Etta French is the brain child of Kathy Dyton who you may very well have heard of as she is the owner of stunning bespoke and fine jewellery brand ‘Pearl and Queenie’. I’ve lusted after their jewellery for so long and so when I had the opportunity to help launch Etta French it was an opportunity I couldn’t turn down. Since Kathy already has a huge love for fine jewellery, she decided to pair it up with her passion for fine fragrance and voila Etta French was born. In a nutshell Etta French is a luxe scented candle company which hides a contemporary piece of jewellery within their candles. I love this concept because as cliche as it sounds it’s honestly a gift that keeps on giving. It’s not something I’ve tried before so I was excited to see whether it would actually work. The lovely team at Etta French sent me a beautiful package (Thank you Etta French!) and inside contained my jewellery candle. The outer packaging of Etta French candles are pastel boxes and mine was a pale blue one; a colour I’m totally loving at the moment, so you could say I was a little bit reluctant to open it. Even before I opened the box I could smell the fragrance and it smelt divine. The scent I received was ‘Bluebell’ which is described as a scent that is set out to recreate childhoods spent playing in parks and invigorating woodland walks with this fresh, delicate scent. It contains only pure Bluebell, so as to bring British springtime into your home. I was a little bit unsure of how this would smell as I wasn’t even sure bluebells had a scent but once I started burning it, my room smelt amazing. Everything about Etta French says ‘luxe’ right down to it’s packaging. Once I finally gave in and opened the box up, I fell a little bit in love. The candle itself is white and it’s encompassed within an opaque white glass holder with the logo embossed in gold on the side. Super chic. Every candle is hand poured in the UK, using 100% natural plant wax and a blend of exquisite fragrance to infuse your home with luxurious scent. 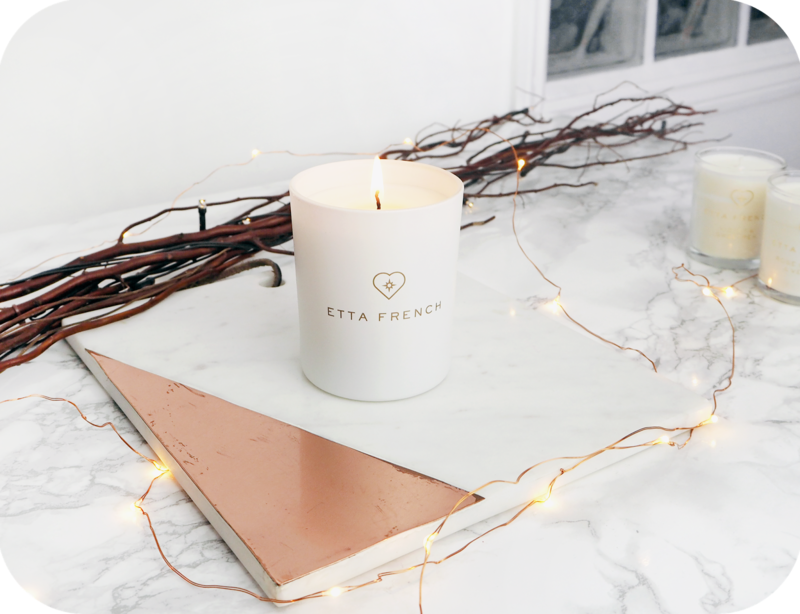 You can just tell the quality and effort that has gone into making the candle and I wasn’t at all surprised to hear that Etta French candles are both sustainable and kind to the environment. The products are cruelty free and clean burning, this means that they last longer and are free of any chemical additives. The burn time for the candles are 40-50 hours and by the end of it, a silver pouch should be revealed. If you’re giving this as a gift and the receiver is unaware of the extra gift inside it will be easy for them to spot because when it’s melted the candle wax is clear and of course something silver floating about in your glass holder is difficult to miss! 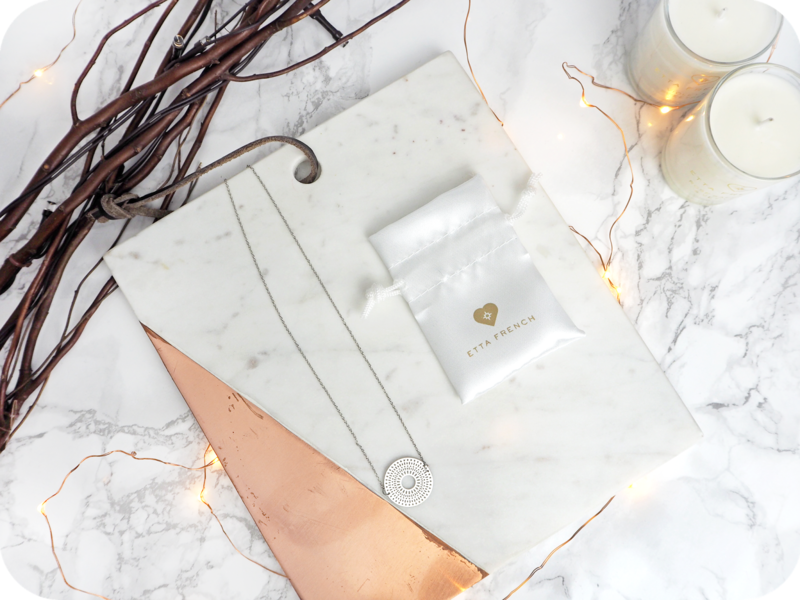 I also love that you get a little branded pouch to keep your new addition to your jewellery collection in. I was so excited for my jewellery that I kept peering inside to see any signs of silver and when it did eventually start showing through I had to keep reminding myself that it’s going to be scorching hot. It’s recommended that you use a pair of tweezers to remove the jewellery pouch out of the candle wax and set it aside to cool. Once it’s cooled down you can open it up to reveal your dainty jewellery. I received a stunning silver circular piece that reminds me of a mandala. It’s something I’ve been looking at purchasing and so I was really pleased with it. If you’re wondering what kind of jewellery that they might do, have a search through the #darlingettafrench hashtag on instagram and see what others have received. There are over 100 designs that were made especially by exclusive UK designers, which means there are so many different things to collect including necklaces, rings, bracelets and charms. I can already see this getting to be a very addictive indulgence! Priced at £37.50, the Etta French Jewellery candles are available to buy from their online store. For me this is the perfect gift (even if it is to myself) because it provides an ultimate experience. A house full of fine fragrance and a little something special to keep even after the candle burns out.